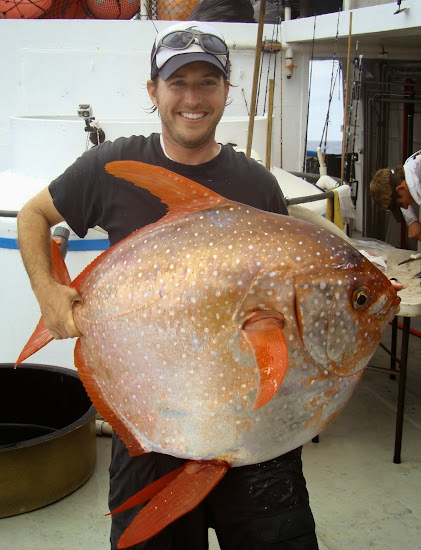 Nick Wegner holds an opah caught during a research survey off the California coast. The opah is the first fish species found to be fully warm-blooded, circulating heated blood throughout its body much like mammals and birds, research has revealed. The fish, found in the waters off the US, Australia and several other countries, generates heat by constantly flapping its fins and has developed an internal “heat exchange” system within its gills to conserve the warmth. 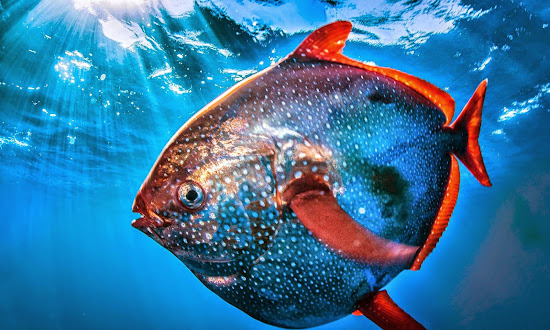 This adaptation means warm blood that leaves the opah’s body core helps heat cold blood returning from the surface of the gills where it absorbs oxygen, maintaining an average body temperature of about 4C to 5C. This system, likened by scientists to a car radiator, is similar to that used by mammals and birds, which are known as endotherms for their ability to maintain body temperature independent of the environment. Opah are found in waters off the US, Australia and several other countries. While tuna and some sharks can warm certain parts of their bodies, such as their brains and eyes, fish are generally classed among cold-blooded animals, known as ectotherms. Scientists at the National Oceanic and Atmospheric Administration discovered the opah’s unusual internal system after analysing samples of gill tissue from fish captured off the west coast of the US. Opahs, which are an oval-shaped fish roughly the size of a car tyre, use this adaptation to become more effective predators. It swims faster, reacts more quickly and sees more sharply than the other marine life that, like the opah, dwell 50m to 400m underwater, NOAA said. “Before this discovery I was under the impression this was a slow-moving fish, like most other fish in cold environments,” said NOAA marine biologist Nicholas Wegner, who led the research. “But because it can warm its body, it turns out to be a very active predator that chases down agile prey like squid and can migrate long distances. “There has never been anything like this seen in a fish’s gills before. This is a cool innovation by these animals that gives them a competitive edge. The concept of counter-current heat exchange was invented in fish long before we thought of it,” he said. Opahs, which can weigh up to 90kg, have fatty deposits around the gills, heart and muscle tissue in order to provide insulation from the cold water. The species’ rich meat has become popular among seafood aficionados but NOAA said there is no evidence opahs are in decline and populations may even be growing. NOAA said it was now interested in comparing opahs from different parts of the world to see how they have evolved warming mechanisms in deep, frigid waters.